St. Nicholas was born sometime in 280 in Patara, Lycia, an area that is part of present-day Turkey. He lost both of his parents as a young man and used his inheritance to help the poor and sick. He was a devout Christian. Later, St. Nicholas served as bishop of Myra, a city that is now called Demre. There are many legends about St. Nicholas of Myra. One story tells how he helped three poor sisters. Their father did not have enough money to pay their dowries and thought of selling them into servitude. Three times, St. Nicholas secretly went to their house at night and put a bag of money inside. The man used the money so that one of his daughters could marry. On the third visit, the man saw St. Nicholas and thanked him for his kindness. He also reportedly saved three men who were falsely imprisoned and sentenced to death. St. Nicholas is believed to have died on December 6, 343. Over the years, stories of his miracles and work for the poor spread to other parts of the world. He became known as the protector of children and sailors and was associated with gift-giving. He was a popular saint in Europe until the time of the Reformation in the 1500s. The Dutch continued to celebrate the feast day of St. Nicholas, December 6. It was a common practice for children to put out their shoes the night before. In the morning, they would discover the gifts that St. Nicholas had left there for them. 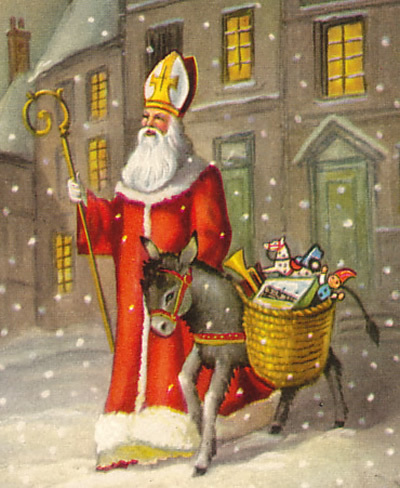 Dutch immigrants brought St. Nicholas, known to them as Sint Nikolaas or by his nickname Sinterklaas, and his gift-giving ways to America in the 1700s. In America, St. Nicholas went through many transformations and eventually Sinterklaas became Santa Claus. Instead of giving gifts on December 6, he became a part of the Christmas holiday. St. Nicholas is the patron saint of bakers, brides, children, Greece, grooms, pawnbrokers and travelers. Follow this link to discover more about St. Nicholas and the traditions of celebrating St. Nicholas Day. St. Nicholas Center.